For All the Generations of Nuns That Labored in the Vineyards of the Lord, “Sr. Anne’s Hands” is a Testament to Your Humanity! March upcoming, is Women’s History Month and March 8th through 14th several years ago, saw the first ever National Catholic Sisters Week that is intended to celebrate the generations of sisters who have taught in schools, served in nursing homes, orphanages and hospitals throughout the United States. Generally, they were the glue that, in many ways, held the institution of the Catholic Church together seamlessly. And they did this all with a quiet determination and dedication with little recognition other than the conviction that their lives and the thousands they touched, were a testament to the faith they believed in. Sadly their numbers are dwindling as young people choose other avenues of service. And, with the recent horrific admissions by Pope Francis of decades of abuse of many nuns at the hands of priests, and even bishops, I felt it compulsory to laud the work of these generations of women that labored in the so-called “vineyards” for years on end with little recompense or recognition. The secrecy and silence of the church concerning these crimes is untenable. The International Union of Superiors General that represents 2,400 Superiors General of orders around the world has spoken about this, as well as Women Church World, an insert in L’Osservatore Romano, an Italian newspaper founded in 1861. Its aim is to… “provide complete and accurate information on international affairs and the cultural debates and events happening in the Church on every continent. Perhaps a children’s book blog is an less than perfect place to highlight this. But anything that affects the lives of children, and those who care for them in a culture where silence, plus a lack of honesty and openness in the face of evil, is too often accepted as the norm, should have a place for discussion. And, so it is here. 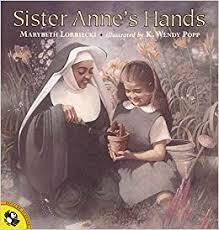 All of this put me in mind of these woman via a wonderful picture book I remember, called, “Sister Anne’s Hands” by Marybeth Lorbiecki, with illustrations by Wendy Bopp. And, since February is also Black History Month, I wanted to feature this picture book in The Snuggery. Sister Anne is an African-American sister teaching in a parochial school in the 60’s. Her teaching and storytelling methods are inventive and interesting as Wendy Bopp’s illustrations portray Sister Anne’s students held in rapt attention when she speaks. Get any black on you. And Sister Anne opts to react to the racial discrimination in her young charges by informing them of her own experiences and heritage that causes some parents to withdraw their children from the class. But the children who remain are the fortunate ones. They are the recipients of the wisdom and talented teaching of a wonderful young woman who has an innate love for the young minds that come into her sphere for one special year. Young Anna in Sister Anne’s Hands, and it seems, the author herself, are both lucky enough to have come under the influence of a dedicated sister whose persona is only symbolic of the thousands like her. Wendy Bopp’s beautiful art work coupled with Ms. Lorbiecki’s view on a very contemporary issue of the 60’s is beautifully executed. And in that same vein, this book put me in mind of a sister I once met that recently passed away. She became the teacher of a young African-American student named Clarence Thomas; the very same Clarence Thomas that went on to become a Supreme Court Justice. Her dedication to the teaching of young African American students at a time in our country’s history when it was, to say the least, frowned upon, was both heartfelt and heroic. This sister, and others of her order, put the education of ALL children first. Her core belief, put into action, was that every student deserved to have an equal chance at reaching his or her goals, and her entire life was in the service of that belief. And, by the way, I had a Sister Anne-like teacher too! Her name was Sr. Mary Michele.